The "Board Fire" claimed 7 1/2 acres on the Lower Board Ranch property in west Hailey Monday afternoon before being contained by several fire agencies. 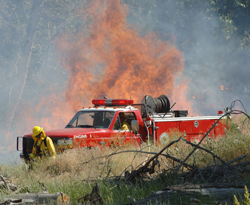 The cause of the fire, which spread rapidly in the cotton and jumped to tall trees, is under investigation by the Hailey Police Department. Why the wait on Rapport arrest?